So it’s because of that that I am so pleased with this cake. 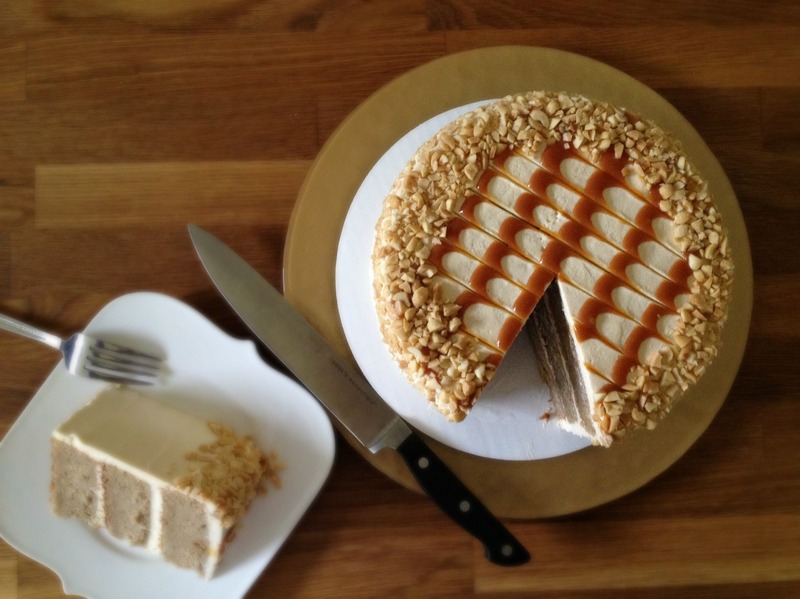 This caramel apple cake. A week ago, I had planned on making it over the weekend because I wanted to, on the last day of the month and what often feels like the last day of fall, profess my love of caramel apples. (You know that the Christmas commercials always start running on the eve of the 31st.) Since I was very young, I’ve associated caramel apples with fall and Halloween. But as news of the storm became louder, it felt like making it was no longer a desire but a necessity. When I went to my local farm to pick up a whopping four pounds of assorted apples for my cake, I saw scrambling workers, trying desperately to pick, collect, and store the apples on their trees. They would need to rush, to save as many as possible before Sandy plucked them off herself, smashing them to the ground like cheap plastic ornaments. I knew these would be my last locals. I snatched what I needed in addition to some to snack on out of hand. I was so grateful for these apples, for this cake. And I sat out to make the Caramel Apple Cake I had been dying to make from Baked Explorations and I tried to make it as caramel appley as I could–as close as a cake could come to what my ideal caramel apple was and still is. I ate my first apple on a stick at my grandmother’s. I’m not sure from where she got it. It was a small MacIntosh, a little mealy but flavorful, covered with a paper-thin, red candy coating. I didn’t like it. While the shatteringly thin coating was fascinating, it stabbed my gums and stuck into every last divot of my teeth. Its flavor was faintly medicinal. My second was from the grocery store: a Granny Smith covered in a too-sweet, chewy caramel. A real caramel apple. The taste wasn’t there, but it gave me an idea of what I wanted a caramel apple to be: tart-sweet, intensely chewy, with deep caramel flavor, coated in salty peanuts. I’d try them at orchards once I got a bit older but they all used the same premade caramel dip, so they all tasted the same. I wished and hoped that a neighbor would hand me a homemade one on Halloween night, like in the movies, but every year I just received fun-sized candy bars (and a couple of coughdrops…). 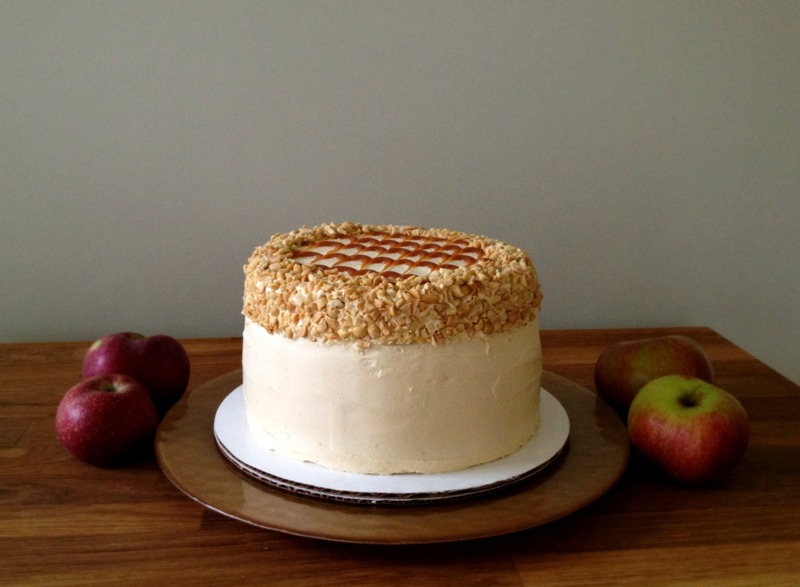 So this cake is the baked embodiment of my ideal caramel apple. It’s super-appley, fortified by a homemade applesauce made from my favorite sauce-making apples. I was pleasantly surprised that their unique characteristics actually came through in the final cake. The cake is covered in an old-fashioned boiled milk–style frosting that I love: It’s as smooth as a Swiss Meringue Buttercream but not as overwhelmingly rich. (I love Swiss Meringue, but you know how it can get sometimes.) It gets big flavor from the incorporation of a caramel sauce which I, frankly, like to bring almost to the point of burning; there’s enough sugar and dairy in this dessert, so in order to get real caramel flavor to come through, the color must be quite deep. It’s that real depth of flavor that so many caramel apples lack. If you want, an extra thin smear of the leftover caramel sauce hidden under every layer goes a long way to bring the flavor home. And if you pipe some on top, you really get caramel-apple goodness in every bite. And although the cake, with it’s piping, already looked like something from the Cheesecake Factory (if you follow my blog, you know my decorating style is much more minimalist) it wasn’t complete, for me, until garnished all the way with salty peanuts, placed so damn predictably. I bent down, took a whiff, and the memories came back: days at the orchard, days making apple crisp, days celebrating my favorite fall treasure. It smelled so much like a caramel apple, I could have bitten into it just like that. I refrained and cut big, honkin’ slices. Even if I didn’t take a photo of the yard, those red trees were there. And with my cake in hand, it was still fall. Adapted from Matt Lewis and Renato Proliafito. See Baked Explorations for the original recipe. Make sure to take the caramel sauce for the buttercream to a dark, dark amber. You should pull it just before it’s burnt. This will infuse the frosting with the deepest caramel flavor. The caramel makes plenty to add to the buttercream, in addition to adding between layers and on top (if desired). I created the applesauce below with this cake recipe in mind, but feel free to use your favorite. For the cake: Adjust oven rack to middle position and heat oven to 325 degrees F. Butter three 8-inch round cake pans (or 2 – I only own 2 and one-third of the batter went in the fridge – I let it sit at room temp for a bit – and I baked it in one of the newly empty pans – it worked just fine), line bottoms with parchment paper, and butter parchment. Dust pan with flour and knock out excess. Sift flour, baking soda, baking powder, cinnamon, salt, allspice, and cloves together into large bowl. Set aside. In bowl of stand mixer fitted with paddle, beat butter on medium-high speed until creamy, about 3 minutes. Add sugar and beat until light and fluffy, about 3 minutes. Gently mix eggs together, add in 2 pours, and beat until combined. Reduce speed to low and add flour mixture in 3 parts, alternating with applesauce, beginning and ending with flour mixture. Scrape down bowl and mix for a few more seconds. Give batter a couple more turns by hand (with such a large yield, some is bound to remain unmixed on the bottom). Divide batter among prepared pans and smooth tops. Bake for 40 to 45 minutes, rotating pans halfway through baking, until toothpick inserted in the center comes out clean (or internal temperature of cake measures 210 degrees F). Transfer pans to wire rack to cool for 20 minutes. Invert cake onto large plate, remove parchment, and reinvert back onto rack. Let cool completely before assembling. For the buttercream: In medium saucepan, whisk sugar, flour, and salt together. Add milk and cream and cook over medium heat, whisking occasionally until mixture comes to a boil (stopping whisking for a couple of seconds to see if bubbles break at surface) and has thickened, about 10 to 12 minutes. Transfer mixture to bowl of stand mixer fitted with paddle. Beat on high speed until mixture and bowl is completely cool. (Depending on your mixer, this could take 10 minutes or more.) Reduce speed to low and add butter, a few pieces at a time, and vanilla. Mix until thoroughly incorporated. Increase speed to medium-high and beat until light and fluffy, about 2 minutes. Frosting can be stored in the refrigerator for up to 1 day. Bring to room temperature and beat until fluffy again before using. Place 1 cake layer on serving platter. Trim top to create flat surface (or use cake strips, and you’ll never have to do this!) and (if using) spread a thin, thin layer of leftover caramel on top, leaving 1/2 inch border. Evenly spread about 1 1/4 cups of frosting on top. Add the next layer, trim, spread with caramel, and frost. Add the third layer. Spread thin layer of frosting over sides and top of the cake and put it in the refrigerator for about 15 minutes to firm up. (This “crumb coating” will help to keep loose cake crumbs under control when you frost outside of cake.) Frost top and sides with remaining frosting. Drizzle or pipe on a few swirls of caramel (if desired). If using, apply peanuts, making a 1-inch border around top and down side. This cake will keep beautifully in a cake server at room temperature for up to three days, as long as the weather is cool and humidity free. Otherwise, place the cake in cake server and refrigerate for up to three days. Let a chilled cake sit at room temperature for at least two hours before serving. In medium saucepan, combine sugar, corn syrup, and water. Stir the mixture gently without splashing sides of pan. Turn heat to medium-high and continue stirring until the sugar dissolves. Increase the heat to high, stop stirring, and bring to boil. Once caramel turns very dark amber and just before it begins to smoke, remove from heat, add butter and cream, and whisk until combined. Whisk in salt. Caramel sauce can be refrigerated for up to 1 week. Bring to room temperature before using. For snacking, feel free to add your desired flavorings—some cinnamon sticks, maybe a dash of vanilla or a sprinkle of lemon zest. But for this cake, I wanted this to be all about the apples, so the flavor came through in the cake. No sugar required. I used four of my favorite applesauce apples: Fujis, Empires, Cortlands, and Mutsus. Choose ones with different but complementary personalities. Peel the apples in long spirals and add the peels to the pot. If you peel them this way (see photo below), they are easy to retrieve at the end of cooking and they add an immense amount of flavor. 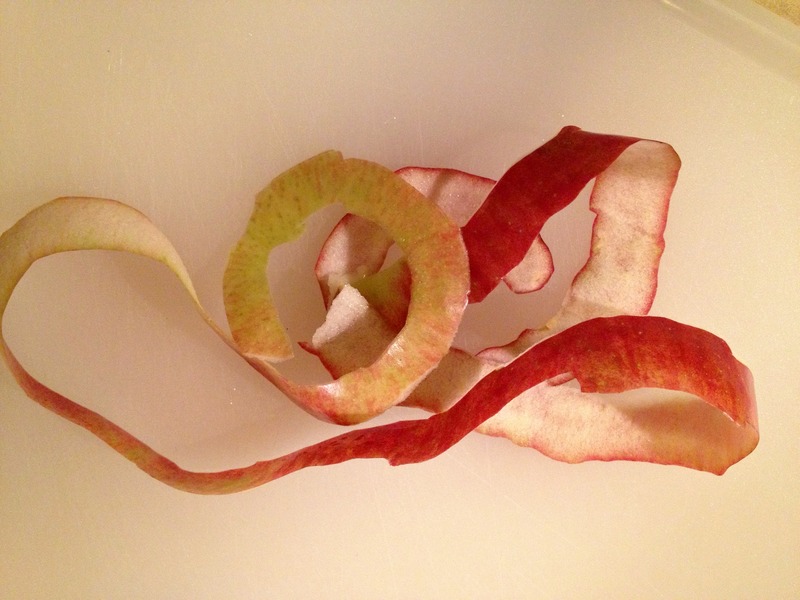 Peel apples in long spirals. Place all ingredients in Dutch oven and bring to boil. Once boiling, stir mixture, reduce to simmer, and cover pot. Let cook, stirring a couple times, until apples break down and become soft enough to mash against side of pot with spoon. Remove peels and place in center of paper towel. Squeeze peels and let drain into pot. Transfer mixture to food processor and process until uniformly smooth. Let cool completely before using or storing. 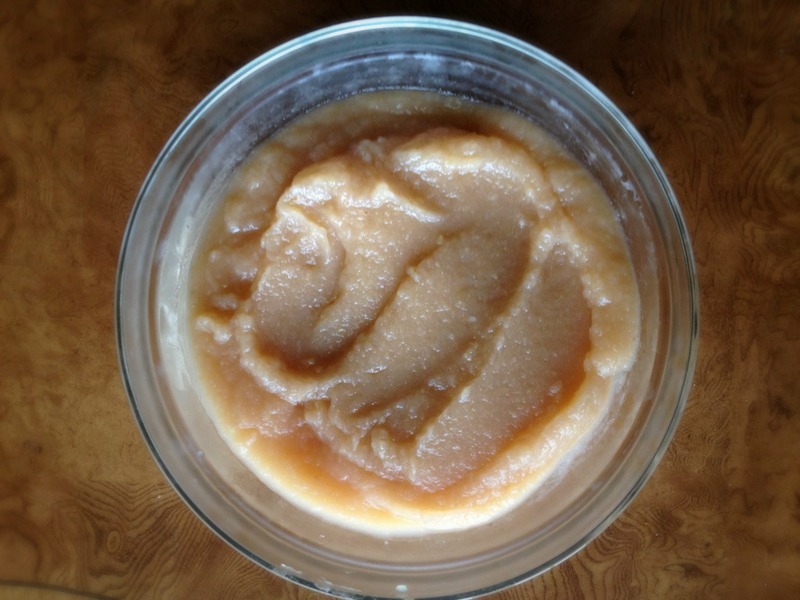 Applesauce can be refrigerated for up to 2 days. This looks absolutely wonderful and the perfect celebration of autumn. 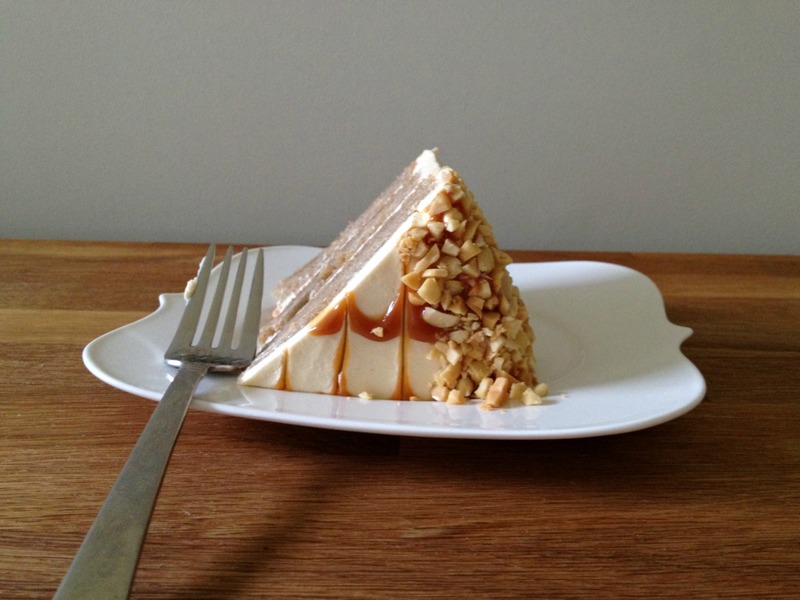 I love the idea of the peanuts crunching against that smooth caramel icing too – just gorgeous. Gorgeous cake. We had a carnival-themed dinner with some friends this past weekend and I was looking to make a dessert similar to this. In the end, I went with actual caramel apples, but they were made with bourbon caramel, dark chocolate and alder smoked salt, so not quite the ones we remember from childhood. Dang good, though. good choice, Carmel–those apples sound amazing! Confessions are welcome here; this is a judgement-free zone ;). Wow! What a beautiful cake, Sacha. I’ve always wanted to make that cake, too, but never got around to it. Yours is stunning!